The first evening in our new hometown of Eugene, Oregon, my wife and I walked to a grocery store across the street from our temporary lodgings to purchase some take-out food for dinner. And while there are over five hundred wineries in the Willamette Valley, don’t ask me how many places make beer. But there are “a lot,” or at least “plenty” to keep you tasting and drinking your life away, at least for a good while. The headwaters of the Willamette River are high in the Cascade Range. The water flows down-mountain, north and west, until it reaches Eugene where it turns more toward the north, heads past Corvallis, Albany, Salem and other burgs, augmented by the McKenzie River at Eugene, and the Santiam, Pudding, Clackamas and other rivers until it reaches Portland where it empties into the Columbia River on its way west into the Pacific Ocean. The easternmost outpost on the Ale Trail is Brewers Union Local 180, a British-style pub in the small town of Oakridge, up in the Cascades forty-four miles east of downtown Eugene, not far from where the Middle Fork of the Willamette begins its seaward journey. 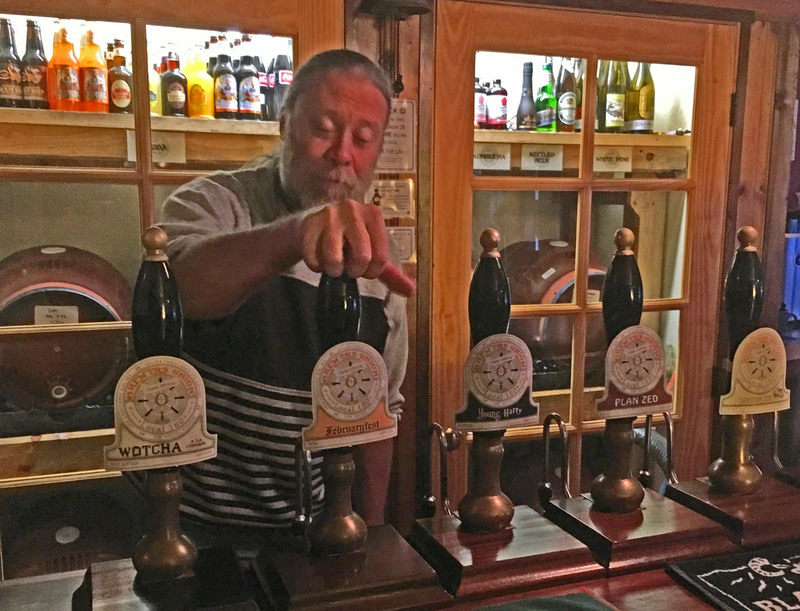 The owner, Ted Sobel, learned the craft of brewing in the United Kingdom. As I approached the pub on a chilly Wednesday evening in April, a disgruntled “local” walked away muttering to himself after discovering that the pub wasn’t open that night. But I, along with a fellow travel writer, Tamara Muldoon, and Abbie Youngs, our host from Travel Lane County, were welcomed inside for a private tasting. But don’t expect to have the pub all to yourself if you come in summer, which in my mind is the perfect time of year to sip a pint of cold beer. Oakridge and the surrounding Willamette National Forest are a mountain-biking mecca that draws riders from around the world to its trails. And mountain bikers, like travel writers, have been known to imbibe the hoppy beverages that Brewer’s Local 180 has on tap. The City of Eugene straddles the Willamette River, and butted up against it, cheek-to-cheek, is the neighboring metropolis of Springfield. On what was once a seedy stretch of Main Street frequented by drug dealers and addicts, you’ll find Plank Town Brewing Company serving up beer, cider, cocktails, wine, and food to go with it. Buy a glass of beer, or do a tasting flight to sample brews with names like “Riptooth IPA,” “Hobbit’s Little Helper” or “Om Gnome,” my “beer-of-choice” to wash down a “Cuban” sandwich when I was there recently. Springfielders told Plank Towns’ owners that they were insane: Customers would never venture to that shady part of town in search of beer. But as it turned out, customers came in droves, the drug-culture denizens moved out, and the brewpub sparked a revitalization of Main Street. 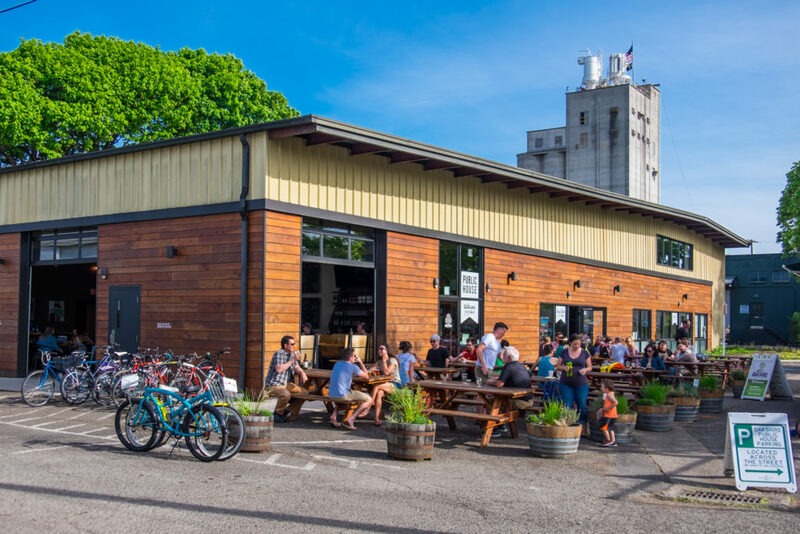 Head east from Springfield, cross the Willamette River, and you can make ten stops along the Ale Trail in downtown Eugene alone. 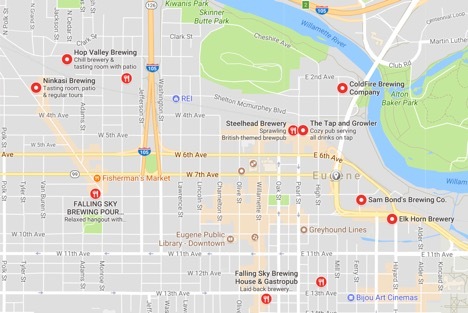 To keep from running into a lamp post, dinging up your car, and losing your driver’s license, Travel Lane County suggests walking between downtown breweries, or taking a taxi or “pub cycle” ride. Or go to the “Eugene Ale Trail” Website, click on the breweries you want to visit, and you’ll see the route to take to get there on the local transit district’s buses. 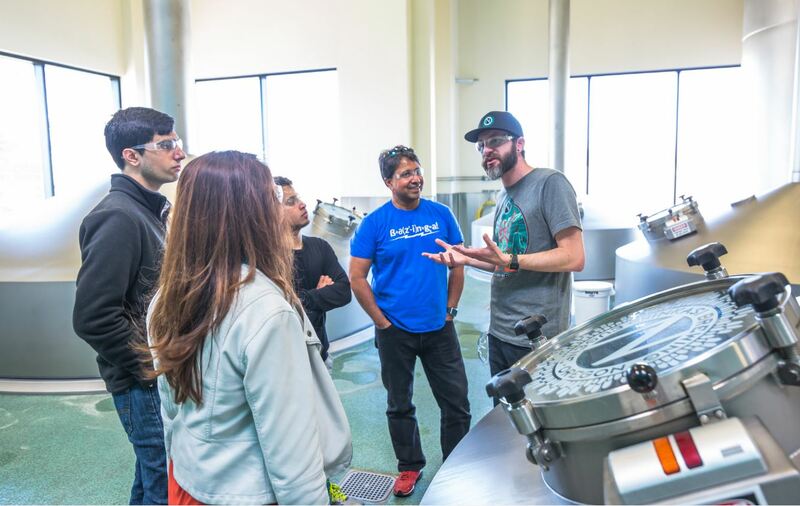 Some of the breweries, such as ColdFire Brewing Company, Oakshire Brewing, and Ninkasi Brewing Company, offer tours so you can learn how the brew you’re about to drink was made. 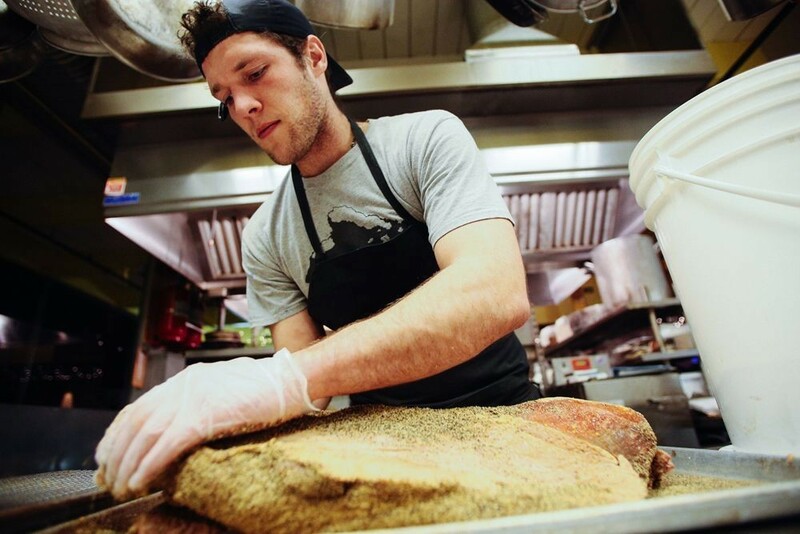 Some of the Ale Trail breweries, like Plank Town, and Falling Sky Pour House and Delicatessen, have their own kitchens that prepare food for customers. Ninkasi Brewing Company has a rotating group of food trucks that park outside and serve up chow. “Burgers on The Run” feeds the customers at next-door Oakshire Brewing. 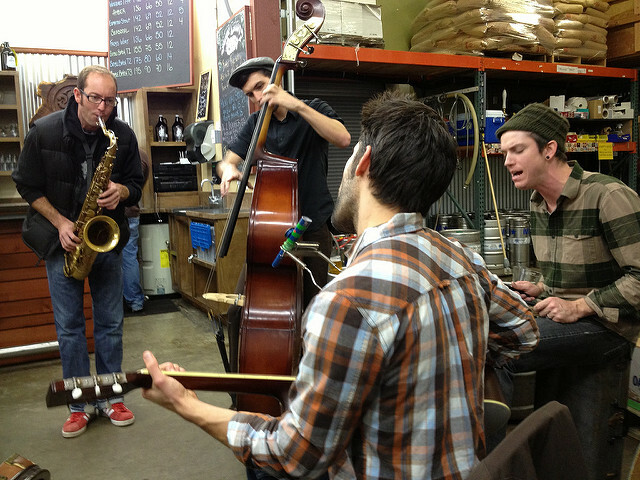 If you want something more than food to go with your craft beer, look for music or other events put on either at the breweries or elsewhere in the Eugene area. 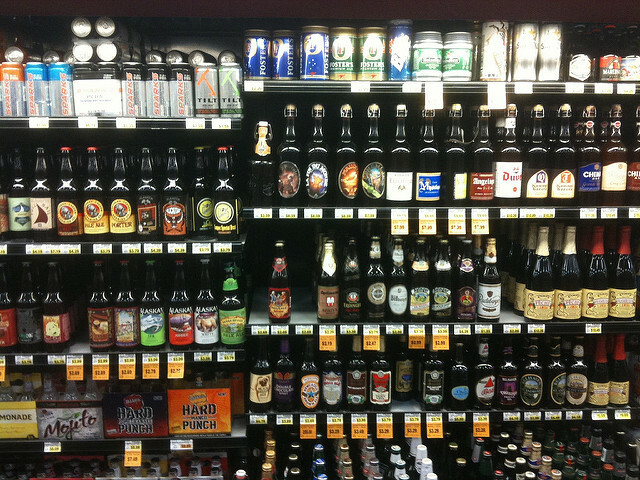 And, if you “lose your way” and stray from the Ale Trail, you’ll find beer available in “mass quantities” at Eugene-area restaurants, such as the Bier Stein, which has more than “1,000 bottles of beer on the wall,” not merely “99” as in the song I used to sing as kid. Arriving in Eugene by Car: Eugene is just off Interstate 5, about a 2-hour drive south of Portland, and less than 5 hours from Seattle, plus stops, and depending on traffic. If you plan to drive up I-5 from the San Francisco Bay Area, figure 10 hours with stops. To cut down the number of consecutive hours spent as a “road warrior,” before leaving the State of California consider stopping overnight at the quiet, former lumber company town of McCloud, about 10 miles east of the freeway, or Mount Shasta City or Yreka, both of which are along I-5. Your other option is to continue north another hour or so to the southern Oregon town of Ashland, home to the famous Oregon Shakespeare Festival, which would leave with only a three-hour drive to Eugene the next day. To experience a different type of “through-the-windshield” scenery, head up Highway 101 all the way to Florence, Oregon, then head east a little over an hour to reach Eugene. Eureka is a good place to overnight along this route which will take you past redwood forests and along spectacular stretches of the California and Oregon coasts. Arriving in Eugene by Air: Several airlines serve the Eugene airport where you’ll find rental cars and shuttle and taxi service. Arriving by Train: Amtrak’s Coast Starlight Seattle-Los Angeles train passes through Eugene about 12:30 p.m. headed northbound and about 5:00 p.m. going south, once daily in each direction. The railroad’s Cascades trains and buses provide more frequent service between Eugene and Seattle, cities in between, with some service to Vancouver, British Columbia. For lodging, dining, and more visitor information on Eugene and Lane County: Visit the Travel Lane County Website.